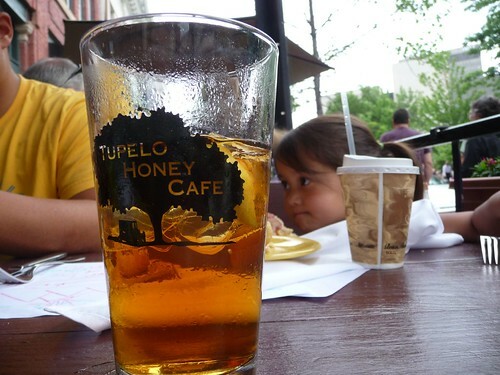 Mali Mish – Day 92: Tupelo Honey Cafe in Asheville, NC. Today, we are headed into the town of Asheville again and getting lunch at the very popular local restaurant called Tupelo Honey Cafe. It is so popular, our estimated wait time when we got there was 75 minutes! Well, we have nothing but time. 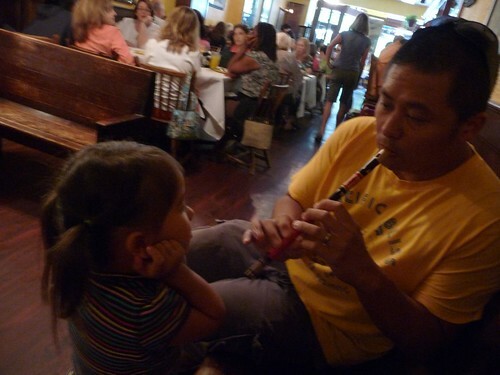 We went next door and did some shopping and bought Ava this little recorder and came back to wait in the rear of the restaurant. Although we were told the wait would be 75 minutes, we were sat down at a nice table on the front patio in no longer than 45. Asheville comes across as being a sort of a hippie town. Hippie here is used in the best sense of the word: Worldly, environmentally conscious and friendly. Although there are also some of the 1960 hippie aspects of Asheville as well. For example, Octopus Garden, a store with 4 separate locations across town, is what you would call a ‘head shop’. Hand blown glass ‘vases’, designer flavored tobacco and tie dye shirts are the kind of stuff you would find there. What does that have to do with Tupelo Honey Cafe you ask? Well, you can buy a bumper sticker sporting the restaurants 3 letter initials right at the cashier. THC. I don’t know the origin of the name but it works for this great eatery in the Great Smoky Mountains of North Carolina. The food arrived shortly and it was well worth the wait. I like to use bacon as an indicator of how seriously a restaurant takes its food. Look at theirs, perfectly fried with just the right amount of curl in it. It’s even the fancy thick-cut, applewood smoked variety with cracked peppers in it. 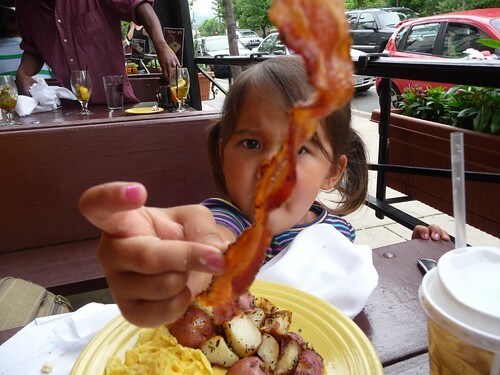 Can you believe Ava is not yet a fan of bacon!?!? Well, we happily took it off of her hands. 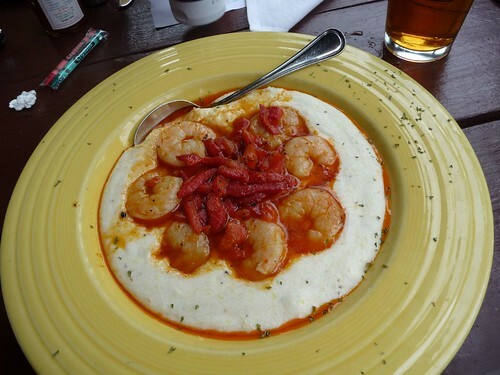 Here is Marlene’s shrimp and grits. Almost looks too good to eat. We stuffed ourselves and headed back to the campsite to spend another afternoon relaxing before heading out tomorrow into Tennessee. 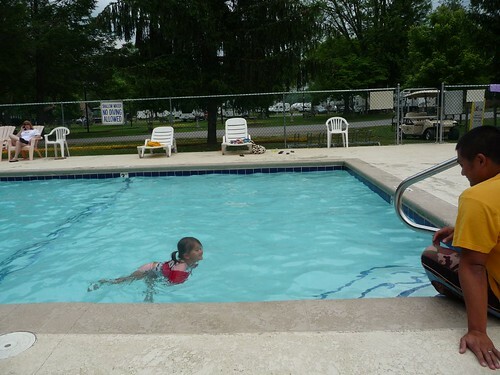 Don’t worry, we made sure Ava waited her half hour before going swimming. Threadless Everywhere – Airstream Edition. 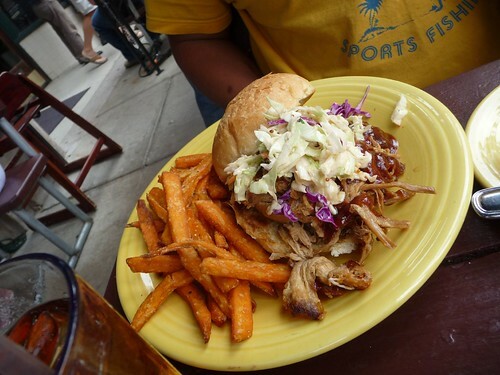 2 Responses to Day 92: Tupelo Honey Cafe in Asheville, NC. Man that bacon looks scrumptious! Just wanted to let you know that we found our Airstream! 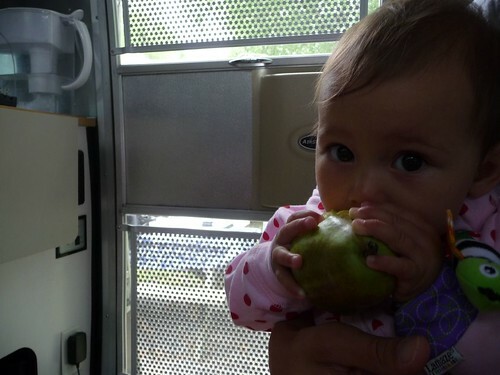 My wife’s blog has some photos (website journey to our haven). She’s a 1974 model and we named her Star, as in “Star of Texas”. Safe travels! congrats on the new purchase! the kids look super excited 🙂 we look forward to your blog adventures!